Born on October 26, 1824, in Willington, Connecticut, Philip Corbin was the third of 10 children. When Corbin was seven, the family moved to Farmington, then to West Hartford, and finally settled in Ellington. When he was 15, the family returned to their homestead, known as Corbin’s Corners, in West Hartford. There, he and his brothers worked on the family farm, were contracted to other farmers, and attended district schools. Corbin attended the West Hartford Academy. At 19, Corbin secured a position in a New Britain hardware factory. In March 1844, Philip Corbin began to work for the Matteson, Russell & Erwin Company (later Russell & Erwin). There he acquired the necessary factory skills to advance in the hardware industry. In the fall of the same year, Corbin worked for Henry Andrews, who had secured a contract to make locks for North & Stanley. At the Henry Andrews Company, Corbin apprenticed and learned the art of lock making. Later, he obtained a contract for himself with North & Stanley. With the contract, Corbin’s brother Frank joined him in New Britain. Soon after, the P&F Corbin Company formed. In June 1848, Philip Corbin married Francina T. Whiting. The two went on to have three children, two of whom survived. They later adopted a daughter. At the end of 1848 the Corbin brothers sought a partner for their newly formed company. In a small factory built by Corbin’s father-in-law, the brothers, along with Edward Doen, began their first manufacturing firm. The first items produced at the factory were ox balls for the horns of oxen and steer. A year later Henry Whiting bought Doen’s interests in the company and the firm became known as Corbin, Whiting and Company. By 1851 the brothers purchased Whiting’s interest and the firm name was changed for the final time to the P&F Corbin Company. Through the latter half of the 19th century the company grew. The firm manufactured builders’ hardware, including coat and hat hooks, sash fasteners, picture nails, locks, and knobs, as well as coffin trimmings. 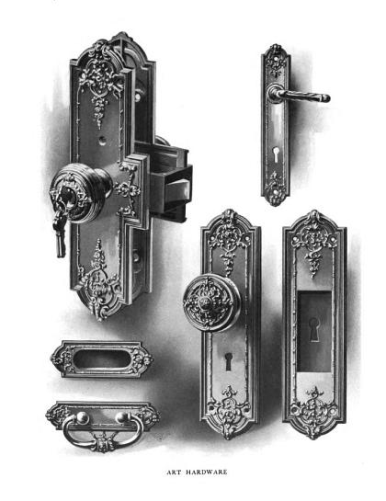 Beginning in early 1870 the company switched its focus to decorative hardware. Many prominent buildings from Boston to Philadelphia, including the Connecticut State Capitol in Hartford are outfitted with Corbin decorative hardware. Philip Corbin also involved himself in business, civic, and religious activities. He was the president of the P&F Corbin Company, the American Hardware Corporation, Corbin Cabinet Lock Company, the New Britain Machine Company, and the Porter and Dylon Company. He was vice president of the New Britain Savings Bank, Director of the Hartford National Bank, the Mechanics National Bank in New Britain, and the Hartford Steam Boiler Inspection and Insurance Company of Hartford. Corbin had a strong interest in civic responsibilities and served as warden of the borough of New Britain before its incorporation, was a member of the city council, head of the Water Commission and was responsible for the supervision of the enlargement of the city’s water supply. He was involved with the South Congregational Church in New Britain and served as the chairman of the Societies Commission. Early on, Corbin was a dedicated Whig and later joined the Republican Party upon its organization. 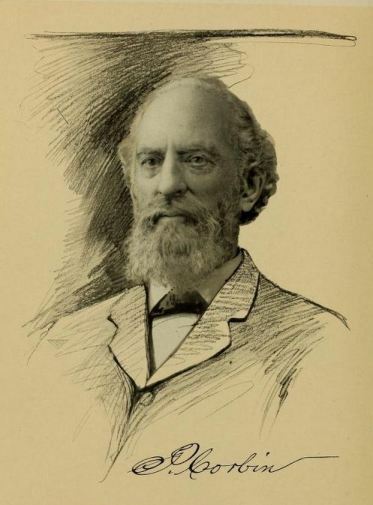 Corbin did not see himself in political life, yet he was elected to the State Legislature in 1884 and in 1888 was made a member of the State Senate. Philip Corbin died after a long illness on November 3, 1910, at the age of 86. At the time of his death, Corbin’s companies employed over 1,800 people and were major manufacturing centers in New Britain, even starting an automobile manufacturing company. The P&F Corbin Company eventually merged with other local manufacturers and became the American Hardware Corporation. Black and Decker purchased the company in 1989. In 2010, the Stanley Works, also of New Britain, purchased Black and Decker, now called Stanley Black & Decker. 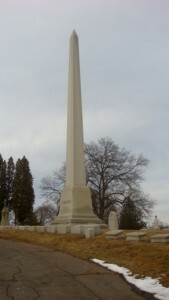 Corbin is buried at Fairview Cemetery in his hometown of New Britain. In May 1999, the Corbin Monument at the cemetery was noted to be the second tallest private family grave marker in the country. The original family homestead is now the spot of Corbin’s Corners, a shopping center. One of the main streets in New Britain, Corbin Avenue, is named after him. “Finding Aid to the American Hardware Corporation Records.” Archives & Special Collections at the Thomas J. Dodd Research Center, University of Connecticut Libraries, 2013. Link. Corbin (P. & F.) House. History of the House of P. & F. Corbin. New Britain, Conn.: Corbin (P. & F.) House, 1904. Link.